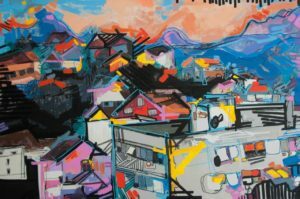 Akron native and painter Lizzi Aronhalt has found a niche in her vibrant and colorful cityscape paintings. Ranging in subject matter from ice cream stands to taco trucks to full on city skylines, her work has a lively and almost musical quality. 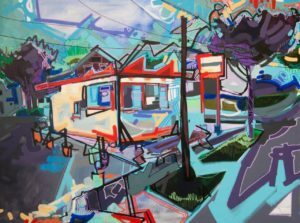 Lizzi Aronhalt’s paintings quickly communicate her love for lines and colors and an appreciation of the architectonic qualities that are found in the urban landscape. Abstract and full of details, Aronhalt’s works always communicate a sense of joy and liveliness. Lizzi Aronhalt was born and raised in Akron, Ohio and had an affinity for art from a young age and through her time at Akron Firestone High school. As a student of 2-D media and arts education at Miami University, her love for painting and drawing grew. After college she spent time in Montenegro, and it was through her time in Europe that she developed her appreciation for buildings and all things structured. 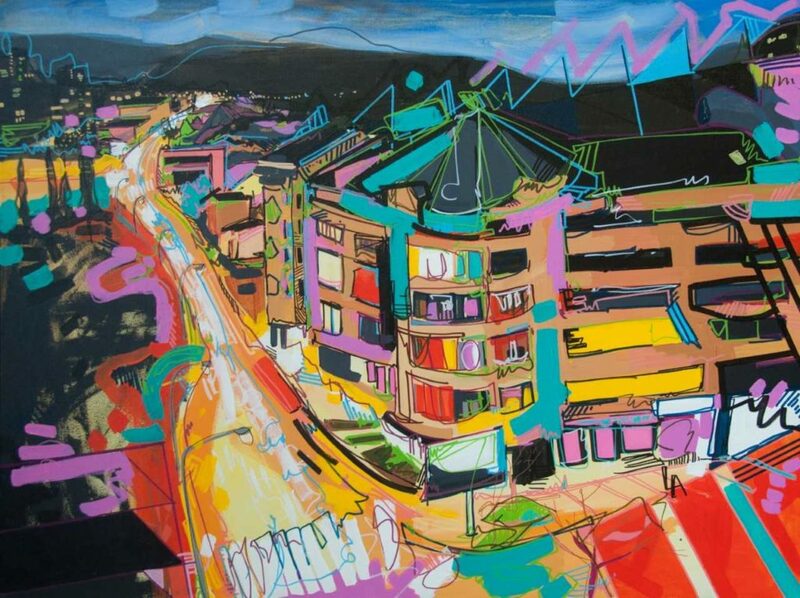 Upon her return to Akron in 2015, Aronhalt slowly jumped into the art scene of her hometown, seeking to capture the buildings of Akron with the same joy that she did those in Eastern Europe. She is an active artist in Akron and works to collaborate and grow arts through teaching and creating. She has a studio at Summit Artspace on East Market Street. Aronhalt’s works have earned her recognition at a variety of juried shows in the region, including multiple honorable mentions and best of show for her work “Lost” at the Evolving Landscapes show at Summit Artspace in 2017. She also serves on the board of the Artists of Rubber City Organization. As an artist I seek to understand and make sense of the world around me through drawing and painting. Painting for me is a method to better understand the ordinary aspects of life and to celebrate them. Much of my recent work is an exploration of the places I inhabit and specifically the buildings I find myself surrounded by. It is exploration and celebration. The paintings do not capture the iconic, but the typical with a fresh view. The scenes and places I have chosen are at times in prominent cities, but they capture the everyday with content such as the skyline of a small city in Eastern Europe, ice cream stands in Akron and corner stores in Cincinnati. Through the work in this series, The Neighborhoods I Know, I hope to share an appreciation of people and places through the use of vibrant color and lively lines. I hope through my work the viewer is pushed to consider and grow their appreciation of the everyday. I also hope the viewer can understand how much I valued the time I spent in these places through the works I have created.